Dessert Menu is a Gaddget in Mario Party Advance. It can be obtained by completing the quest Accessorize!. Dessert Menu can be used to activate a dessert maker. 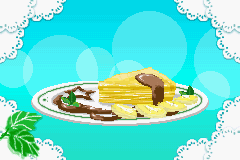 The player can create their own custom dessert. The dessert is always a slice of cake which can have a type of fruit, flavor, and plate. Dessert Menu is similar to another Gaddget named Cake Maker. "Pick a dessert from the menu. Do you see any of your favorites?" This page was last edited on February 18, 2019, at 15:47.